The Foreign Policy Debate: What To Expect : It's All Politics Neither President Obama nor Mitt Romney spends much time talking about international affairs on the campaign trail. Yet foreign policy, the subject of tonight's debate, can often define a presidency. 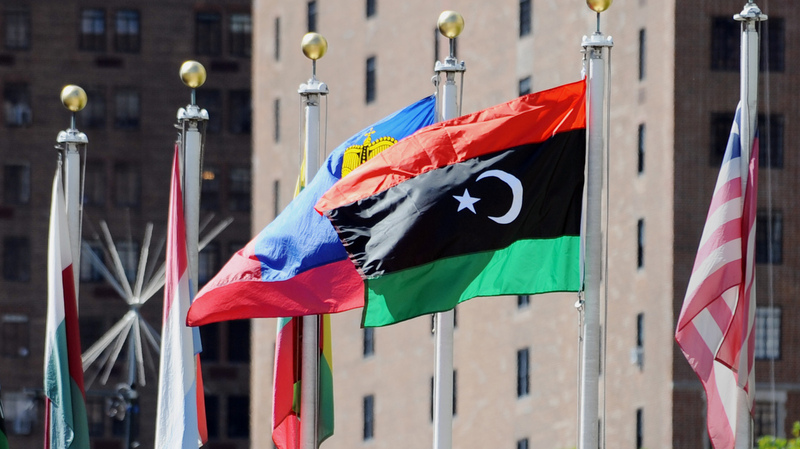 The flag of Libya's National Transitional Council (second from right) flies outside the United Nations headquarters building in New York. President Obama and Mitt Romney haven't spent much time talking about world affairs on the campaign trail, yet foreign policy can often define a presidency. America's next leader faces tough choices that range from redefining the U.S. role in the Middle East to managing the crucial relationship with China. With that in mind, let's look at the topics most likely to come up in tonight's foreign policy debate — the candidates' final faceoff — in Boca Raton, Fla., and how international issues will shape the next administration. The Attack In Libya: Romney calls the Sept. 11 attack on the U.S. Consulate in Benghazi a major security failure and has hammered away at Obama for the past month. It's sure to come up tonight, even though the president was widely viewed as having effectively fended off Romney's attacks during last week's debate. The irony is that Americans are probably more popular in Libya than in any other Arab country. Many Libyans are extremely grateful for the U.S. role in helping oust dictator Moammar Gadhafi last year. The broader question for the candidates is what kind of relationship the U.S. will forge with Libya and other Arab states where longtime autocrats have been ousted, and new leaders, many of them Islamists, are coming to power. Getting Tough With China: Threatening to punish China over trade disputes is now a staple of presidential campaigns. But once in the Oval Office, presidents tend to be more cautious. Obama says he has been tough on China; Romney says Obama hasn't been nearly tough enough. The U.S. and China are the world's two largest economies, and neither is firing on all cylinders at the moment. A fight over trade and currency could slow both economies. China undergoes a once-a-decade leadership change next month, and the next U.S. president will have to decide whether he wants to start this important relationship on a confrontational note. China also holds more U.S. debt than any other country — and as some analysts have noted, getting tough with Beijing is a little like getting tough with the bank that holds the mortgage on your home. Iran's Nuclear Program: This could be the single most difficult foreign policy choice facing the incoming president. Obama and Romney both say they will not allow Iran to obtain nuclear weapons. Obama says recent sanctions are punishing Iran's economy and holds out hope that negotiations could still produce a compromise. Romney says talks are futile and only allow Iran to buy more time. Both candidates say military action against Iran should be a last resort, though Obama says there is still time before the U.S. needs to make that decision. Romney has been more sympathetic to Israel's timeline, which stresses the urgency of acting sooner rather than later. "If I had to bet the mortgage ... I'd say we'll still be in a twilight zone on the Iranian nuclear issue this time next year — suspended somewhere between a war nobody wants and can afford and negotiations and sanctions that have not been able to stop the mullahs' search for a nuclear weapons capacity." The Size Of The U.S. Military: The two candidates may be most divided on this national security question. Obama believes military spending needs to come down after a major expansion in the 11 years since the terrorist attacks of Sept. 11, 2001. He has emphasized smaller operations: a limited surge in Afghanistan, drone strikes in multiple countries, and the raid that killed Osama bin Laden. Obama oversaw the end of the U.S. war in Iraq and set an exit date in Afghanistan. Romney says Obama's policy is a recipe for a declining U.S. role in the world. He opposes military cutbacks and believes the military should be larger in many areas. Obama has challenged Romney to say how he will pay for this. Withdrawing From Afghanistan: During day-to-day campaigning, Afghanistan has been a virtual non-issue. But debate moderator Bob Schieffer of CBS News is likely to raise the subject tonight because thousands of U.S. troops are still embroiled in combat. Obama has set a timeline that will bring U.S. forces home by the end of 2014 and put the Afghans in charge of their own security. Romney has criticized this approach, saying the U.S. should not tell the Taliban when the U.S. plans to leave because it just encourages the insurgents to bide their time until the American departure. But beyond this, Romney has not proposed any significant alternative to the current course.